New stadium: Crooked running track, but check out that view! Usually we see stadia take up names of famous people or places where they stand. Not in this case, though. Almost at the heart of Tacoma is a stadium that gave the name to nearby school and in fact the entire district! And no wonder, because it’s not a regular stadium by no means. It was created in 1910 by the pushing down of 140,000 m3 of soil in the Old Woman’s Gulch. The existing gulch was widened to accommodate both a football field and running track. Around them were stands in the shape of asymmetric horseshoe opened towards the Commencement Bay. With 31 rows of very steep terracing, they were able to hold some 32,000 people, earning what was then called Tacoma Stadium its crucial role as the city’s largest sports venue. 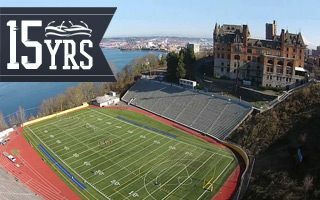 Built just 4 years after the completion of adjacent high school (located within a previously unfinished hotel), the stadium imposed its name onto it, making the Stadium High School a landmark. In fact, together these buildings create a legally protected site. Protection means this place should not be significantly altered, though its limitations seem obvious. Perhaps most after the ground proved unable to hold the entire stadium in 1970s and 80s, forcing the collapse of parts of it and thus limiting its capacity to the current 15,000. One different compromise is the running track, which was never possible to reach its desired shape due to insufficient room. Until 2010 it was still a complete circuit (left in above photo), even if oddly-shaped, but after field enlargement only stumps of the track were left. The building is also notorious for being flooded after heavy storms as the steep staircases turn into cascading waterfalls (check the below video! ).